At the end of a long, stressful 24 hours of racing, it’s safe to say the three cars did pretty well. All three cars finished, though not looking as clean and race ready as they did at the start. But that’s endurance racing, even in a video game. The first five stints went well for all three cars. Distance was being made and we were clean. Although prototype finishing position was a good question nearly all race, it became clear early on that the Ford GT, surprise surprise, was faster than the rest of the GT field. Dr. Chair had the best description of that car: BoP Monstrosity. Sure, we all had a few scary moments early on in the race, but it’s to be expected. Le Mans is a twenty four hour sprint race and you’re bound to be going at least one hundred percent during your stint. Darkzer was going at least 115 percent! As with most races, it’s the night where the incidents begin. In fact, we all suffered in the same stint. I led off the unfortunate chain of events for our team in stint 6. Exiting the Porsche Curves, a car went off in front of me. Unable to avoid him, my car was collected and sent into the wall on the other side of the track, causing heavy damage to the driver’s side front of the car. Luckily, because of the location of the incident it wasn’t a long limp back to the pits. Unfortunately, replacing the suspension and the brakes took a while, and we lost valuable time and track position. The #271 Corvette would finish the race with more tape than bodywork on it’s front end. Soon after, the pro car, the #65 Corvette, suffered engine damage while downshifting into Indianapolis. Although Cowmaster brought the car back to the pits, it would spend the remainder of the stint in the garage undergoing repairs. Equally disappointing was the #84 Porsche 919 of Capirossi having to spend the rest of the stint in the garage due to the hybrid system overheating not twenty minutes later. As both those cars are full season entries, their shortened stints were the issues that hurt our team the most. The #65 Corvette showing evidence of perhaps too much wheel to wheel racing on the door. Following the disastrous stint 6, the remainder of the race went to plan. Our Corvettes stayed alive and clean while the Porsche fought tooth and nail to gain advantage over the faster Toyotas and Audis. I wouldn’t want to be the guys cleaning that car post race, let’s just leave it at that. In the end, none of our cars scored a podium position. Perhaps more importantly, however, we survived the race and brought the three cars home. 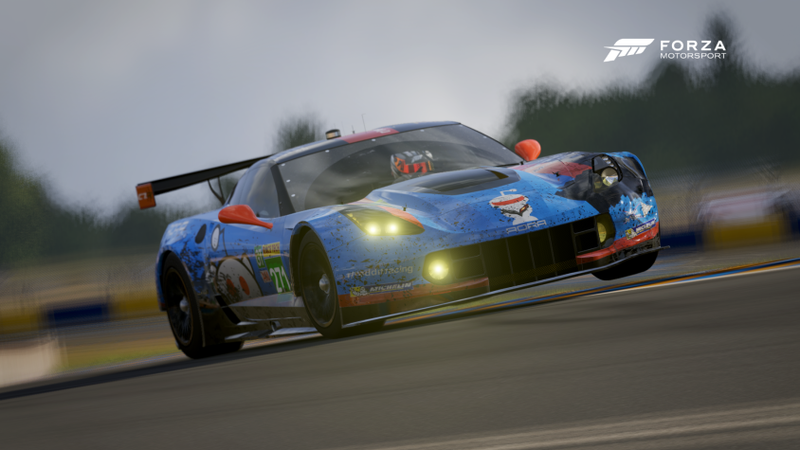 The guys in the #84 Porsche completed the top five overall and both Corvettes finished in the top ten in GT, with the #271 in seventh and #65 in ninth, respectively. Personally, as one of the slow guys in the Am car, and the one that binned it, I couldn’t be more happy with a seventh place finish. I’d like to thank my pro team mates SVTyler, Chair, and Cereal for being blisteringly fast and my fellow amateur driver, Kiwi, for keeping the car out of trouble! Now if you’ll excuse me I’d like to go a few days without seeing a blue C7.R!